Grandparents are often caught in the tensions between parents when divorce takes place. Eager to help ease the situation, many grandparents are confused about how they can play a part in addressing the pain, confusion and other emotional issues that may be affecting their innocent grandkids. 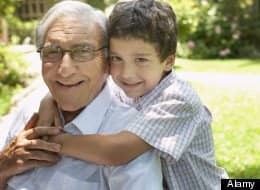 Every divorce is unique there are no cookie-cutter solutions that do the trick, but there are some guidelines to keep in mind, especially in regards to being there for your grandchildren. If you haven’t been close to the kids beforehand, post-divorce is a difficult time to develop a relationship. But if you already have that bond established, it’s important to keep the ongoing connection at this time when the children are facing so many unknowns. When communication and trust are strong between you and your grandchildren, it’s easier to bring up issues that concern you for a chat. Children who are comfortable in their relationship with you are more likely to confide their frustrations, fears and insecurities to you. Keep in mind that it’s always more effective to offer advice once they ask or bring the subject up. Then you can share your wisdom in an age-appropriate manner. One important word of caution: If you are going to discuss issues regarding divorce or other life challenges, it is essential that you discuss this subject first with the children’s parents to get permission in advance!